Paying down sleep debt improves performance. Sleep extension will give you even better performance. More sleep = greater recovery, a chance to consolidate the mental and physical gains made during the day, fewer injuries and a better mood. You need to maintain a regular sleep wake schedule. Thornton talks about the way sleep is a performance enhancement tool for both brain and body. It improves your recovery from exercise and new skill learning as while you are asleep as all the information on everything you have learnt and done throughout the day is transferred and downloaded. 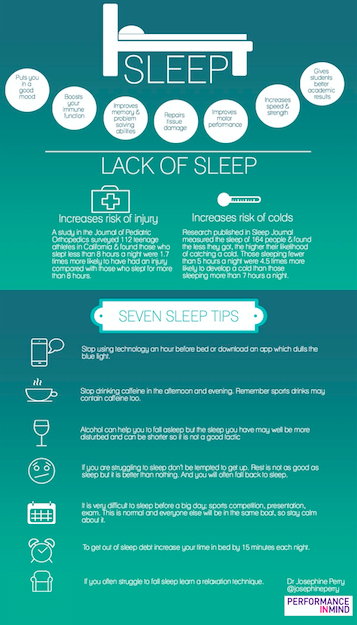 Sleep also helps your metabolism (appetite and weight), tissue repair, immune function and mood. In short, she says that sleep provides a bonus learning period and you wake up a smarter, stronger version of yourself and in a better mood. There is no formula for how many hours athletes should sleep but it is advised to be between 7-9 hours (Federer is said to sleep for 11 hours, LeBron James for 12). Less than six can impair your psychological and physiological functioning. The positive information from your day is the last to be downloaded so you need longer in bed to wake up positive and happier. Stanford Uni ran research with their swimmers who were set a goal of spending 10 hours in bed. The extra sleep opportunity this created improved their speed, reaction time, tumble turn times and kick times. It is normal to take 20 minutes to fall asleep. People often base how long they say they sleep for as the amount of time in bed but research with 124 Australian athletes showed on average they spent 8.4 hours in bed but only got 6.8 hours of sleep. This is 86% efficiency. Falling asleep immediately (around 95% sleep efficiency) is not actually a good sign as it shows you are incredibly fatigued. When you have sleep restriction it is first your mood that is impacted, then your cognitions and finally your performance. So accept if you have missed sleep that your mood will be down – it is likely that your physical performance will be ok. But you will have a perception that exercise is harder. To get out of sleep debt increase your time in bed by 15 minutes each night. Alcohol helps you sleep – but doesn’t help you stay asleep. Jet lag – it takes one day per time zone to adapt. This is for body temperatures to adjust. Altitude – this takes up to two weeks to adapt to. Blue lights from screens mess with melatonin production and stop you sleeping. Use an app to minimize the blue light from your screen. With sleep dictated by our circadian rhythms most of us have a cognitive peak at 9am, a dip at 2pm, a physical peak at 6pm (which could be why more world records are broken in the evening than daytime) and will find it difficult to sleep between 7pm and 10pm. We then dip at 10pm. Ideal bedtime. As your ability to do complex cognitive skills peaks earlier in the day during the morning peak and gross motor skills peak later in the day focus your training to match those times; learning new skills or techniques in the morning, endurance or fitness work in the evening. Consider what time you will be racing – if it is at a time you know you dip then a nap in the middle of the day can be used to shift the dip. Napping is a skill. It can take up to two weeks to get into a rhythm with it. It is good for athletes but not necessary for normal people (who should be getting enough sleep at night and don’t need to perform in the evening). If you want to get into napping it will seem hard to begin with but every day you should lie down in the middle of the day and eventually you will sleep. It is very difficult to sleep before competition but this is usually situational and transient insomnia so remember if you are struggling to sleep your competitors are probably too. Don’t get wound up over it. If you are injured you will find it harder to sleep as you will need less sleep than usual as you have not been using so much energy. Reduce your time in bed and lower your expectations of what sleep should be. It is normal to wake up in the night. Don’t panic and think it is insomnia. Learn some relaxation strategies to help you get back to sleep. If you ruminate a lot and find this keeping you awake then after dinner write down your ‘to do’ list and your thoughts so you don’t ruminate in bed. The ‘to do’ list will still be the same in the morning. The thoughts will still be the same in the morning. They won’t have changed and you can remind yourself you can do nothing about them in the middle of the night. Sports psychology developed from traditional psychology but incorporates elements of physiology to understand how psychological factors (such as confidence, stress, concentration or anxiety) impact on sporting performance. It can be used to help athletes improve in competitions but also helps athletes, coaches and the parents of young athletes deal better with elements of sporting life such as training attitudes, injury, rehabilitation, communicating well to other athletes, team dynamics and sporting retirement. Why would someone hire a sports psychologist? If you want to do really well at something why wouldn’t you get someone to help you do it and teach you the tools and tricks to achieve it? You can probably figure out most things for yourself over time; the best ways for you to train, the best foods for fueling yourself, the mental skills you need to perform exceptionally, but working with an expert will speed up the process significantly. You don’t need to be a professional athlete to work with a sports psychologist. You just take your sport seriously and want to be the best at it that you can be. If you have someone working with you on your coaching plan, or see a nutritionist, or have regular sports massage why would you not work with someone to help you understand how your mind works and to help you think and behave in the most beneficial way when you are training or competing? Why would I hire you to help me with sports psychology? I work from a positive psychological perspective, supporting athletes to value what is already going well in their sport and finding strategies to help them focus on improving the areas that are holding them back. My aim is to really listen to athletes to find out what may be causing their issues or constraining them. I have a number of routes and strategies athletes can try and a number of mental skills I teach. Often these strategies won’t just help them in sport, they can carry over what they learn into every day life to help them deal more effectively with family, work or relationship issues too. People who traditionally receive psychological support are those experiencing some kind of crisis or mental health issues. But why shouldn’t everyone have access to this help? I believe we can all benefit from understanding better how our brains work, how our behaviours impact us and what we can do to control challenging situations to give us a more successful outcomes. How do you work with athletes? I always like to meet with the athlete face to face first. This is not always possible but I find it makes it a much easier relationship to hold the first session in person. This session is usually a long session which can last up to 2 hours. It will include lots of background information, lots of talking about your sport and often some questionnaires or scales and measures which help to identify areas to really focus on. After this session we will work on a plan for how to move forward. Sessions after this will usually take place over Skype as I find that age group athletes are often very pressed for spare time and feel more comfortable in their own houses. I charge £100 for the first, extensive session and then £65 a session (usually an hour) after that. The plan and the support this requires will dictate how often you will benefit from sessions but to be most effective they are usually held weekly or fortnightly. I usually work from a cognitive behavioural framework. The work undertaken from this perspective helps an athlete manage their problems by changing the way they think about their problems and how they behave in response. It doesn’t remove the problems but it does allow the athlete to deal with them in a more positive wa. It does this by breaking issues down into much smaller parts so negative patterns can be identified. Practical ways (such as specific mental skills) are then taught to change those negative thoughts into more positive and supportive ones. On occasion it may be more appropriate to work from a humanistic framework. Humanistic techniques are used to help an athlete guide themselves to make choices about their life. The sessions are ‘athlete-centred’ and focuses on the athlete’s self-awareness and what will give them complete fulfilment. Through this route the psychologist is there only to guide and to listen as the athlete themselves directs the discussion, the direction that the sessions take and the ultimate outcomes. Which type of athletes do you work with? I enjoy working with athletes from any sport. To date I have worked with Running, Swimming, Cycling, Triathlon, Trampolining, Stunt Cheerleading, Tennis, Duathlon Rugby, Judo and Fencing. I have a particular interest in helping age group and amateur athletes competing in endurance sports and those athletes recovering from injury. 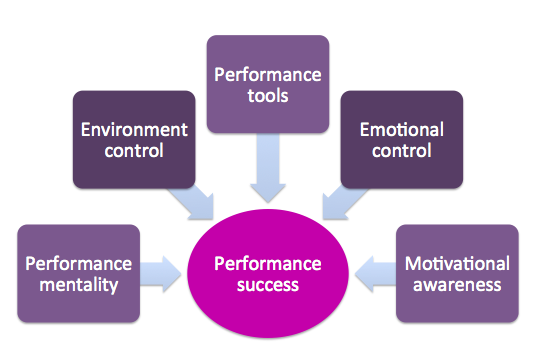 How does a sport psychologist help an athlete improve their sporting performance? If I need to change my appointment with you? We ask for 24 hours notice if you need to cancel or amend your appointment. We reserve the right to charge for any cancellations where sufficient notice is not provided. Payment should be made in advance of the session via bank transfer. Performance in Mind is committed to protecting your privacy in all areas. When you visit the website our computer collects the IP address of your computer, the date and time you visited and the titles of pages you viewed. If you fill in the contact us form we will store the data you send us but this will never be passed on to anyone else. When you speak to us in a consultation any conversation between us is completely confidential unless we feel that you may harm yourself or someone else. Notes may well be taken during your consultation. They will always be stored securely and you are always welcome to read any notes in your file. Can I use information from this site?